In addition to the numerous books and whatnot that's listed at the bottom of the page, these guys also appear in the Star Wars miniatures game and Star Wars RPG by WotC. Since these guys are the main antagonists in the New Republic era and have a ton of references, I can't see why they wouldn't be approved. Granted, this would be a huge undertaking as this would be a very difficult costume to do properly. I may be up to the task if this race would indeed be approved. Are you going to do this costume yourself for sure? Have you spoken to the LMO in regards to this costume? I would strongly suggest touching base with the LMO about this costume and make sure you want to do it before we set up a forum for it's development. Unless there are other people planning to do this costume as well. Also remember, be ready to have visual references ready to post here so you can get the help you need. Right now I'm totally just in the research phase. I'm not totally sure if I can do this now but I wanted to see if anyone else had an opinion on these guys. EDIT** I just found a pic. Its from CIII, but I think its the same guy. Yeah, I think that's the same guy from CIV. At one of the events here in S. Cal. 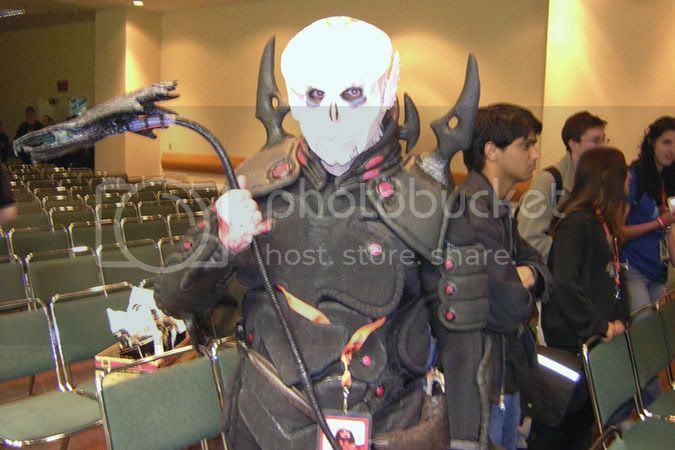 there was a guy who wore a Necromonger outfit from Chronicles of Riddick. It was made out of some hard rubbery foam that was pretty tough but flexible. Lots of detail. Someone said they use that material a lot in Hollywood but I can't seem to find out what the name of the stuff is. It would be the perfect material to use for the Yuuzhan Vong armor. i know quite a few guys who have the Necromonger armour and it isnt foam latex. It is a foam type...i was told what it was but cant for the life of me remember the name....but its firmer and harder than foam latex. Here's is screen used Necromonger armor. I cannot say if this is the same material we are talking about or not. Ah, okay.... armor. I originally thought the discussion was about material used for a vong type mask. Foam latex is the best for that. (Or mask latex, if foam isn't feasible.) For body armor, however.... definitely don't need or want foam latex! If those costumes are made from a foam of some kind, I would guess that it is a sheet material that was shaped rather than an expanding foam, which would take a mold with both a front and back surface. Cool looking costumes, though. That represents a lot of work! been chatting to one of the guys off the London Prop Store who acquired all the Riddick costumes, Hes finding out exactly what the armour was made from but says' J Foam' which is used in the film industry for props would work if mixed with some resin to help make the foam stronger. The Yuuzhan Vong is a race. The term is so general as to prohibit all but the most general of standards from being established. As with Nightsisters and Mandalorians this group is defined by individual expression. I'd like to see this discussion "reshaped", as it were, around defineable LFL commissioned individuals. From there unique references and unified discussion can be established and possible adoption by the 501st determined. In a year or two down the road, I imagine there could be at least one other YV in the costuming community. I'd bet my Plaeryin Bol on it. In a year or two down the road, I imagine there could be at least one other YV in the costuming community. Ok now that is a hint if ever I read one. He is in the Star Wars Databank, several Star Wars Essential sourcebooks, the Star Wars minis game, and several novels and comic books. This is the character I was leaning towards making. He is pretty much in the same reference materials as Nom Anor. If there were going to be Yuuzhan Vong in the legion, these two would be the best candidates hands down. Nei Rin from the Legacy comics, and Mezhan Kwaad and Nen Yim from the NJO book series , who are also featured in NJO source book. Hey get some LFL approved references for this one and I'll get the forum up for this character. Ok, since I have the Star Wars RPG New Jedi Order Sourcebook and the Star Wars miniatues: Universe minis I'll see if I can get some scans up from them. I don't have the Star Wars: The New Essential Guide to Characters so I'll have to see what kind of reference is in that. Same with the comic books. The first one is from the RPG game I believe and the second is from one of the comic books, I have no idea which. The first IS the New Essential Guide to Characters depiction of Nom Anor. The second is from Crimson Empire II. I know this topic's been dead for a while, but I just thought I'd chime in to let everyone know there is still interest in this costume. My husband has started into the research phase for either a Nom Anor or a Tsavong Lah. He's determined to finish it, whether it's approvable or not. We'll work on finding references for it, although the Invasion comics should help a lot when they come out. Anyway: Great idea, great project! You could chat with our user A'Sharad Hett. He's doing a Darth Krayt and could possibly give good advice with the Vonduun crab armor. Leaving the topic of the headdress/face/hand of a shaper, I'm still trying to figure out what they wear! I've also thought of a dress that looks like it is held up by a claw like hook at the neck line. Anyone else have a thought on this?